It’s a glass-half-full-or-half-empty kind of dilemma. Some look at the rapidly changing legal marketplace and envision a looming crisis. Others see a situation that’s ripe for trying fresh ideas and novel ways of providing legal services. Those in the latter group are today’s legal innovators. created greater internal efficiency through operational changes. Know a legal innovator? Are you one? Watch for the call for next year’s nominations in spring 2015. To learn more, visit ThatsaFineIdea.com. 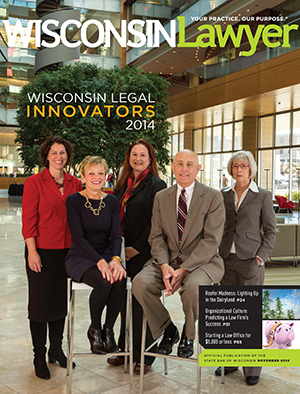 More photos of our innovators on the State Bar of Wisconsin’s Facebook page. From the nominations, the State Bar chose five top legal innovators for 2014, profiled below, as well as five other noteworthy examples (see the sidebar, “On Our Radar: Five More Fine Ideas”). The assortment of nominated projects was “broad and impressive,” says Schaubel. Do you know a legal innovator? Are you one? Think about the Legal Innovators for 2015, and watch for the call for nominations next April. Kelly Twigger: Yes, There’s an E-discovery App for That! A decade ago, Kelly Twigger sat in a small room in New York City with a few other attorneys at an American Bar Association seminar on electronic discovery. She came away thinking, “This is going to be huge.” Little did she know where that thought would lead. She returned to her litigator duties at Quarles & Brady in Milwaukee and soon started the firm’s first records retention and electronic discovery practice. In 2009, she left to launch her own company, ESI Attorneys, based in Boulder, Colo. The company’s goal was to help clients better leverage their electronic discovery practices and procedures. The next big step came in July 2013, when ESI started selling an iPad app called eDiscovery Assistant™. The app has six major content areas: e-discovery rules, case digests, templates, checklists, a glossary of terms, and resources to consult to learn more. Content gets updated weekly, which is essential in this rapidly changing area. The eDiscovery Assistant aims to be easy to use. Lawyers, judges, and other legal professionals can search content by judge, jurisdiction, or specific issue tags. If you’re a Milwaukee resident struggling to make ends meet by holding down two or three jobs, you have no time to go to a legal clinic downtown or at some other location. Nor can you afford to take time off from work to get to a distant clinic. A solution to that dilemma is a bus transformed into the Milwaukee Justice Center’s Mobile Legal Clinic, opened in September 2013. The Justice Center is a collaborative endeavor of Marquette University Law School, the Milwaukee County Bar Association, and Milwaukee County. The Mobile Legal Clinic opens one Saturday a month for four hours at various locations around Milwaukee County. It came into existence because attorneys Frank Daily and Julianna Ebert wanted to honor fellow Quarles & Brady partner Michael Gonring for his career-long pro bono service by donating funds to the law school to launch some sort of project. Gonring then approached Angela Schultz, the law school’s director of pro bono and public service, to brainstorm ideas. After discussion of several possibilities, a mobile legal clinic popped to the top of the list of prospects. Two or three attorneys and three or four law students typically are on site for each two-hour shift when the clinic is open. In the first year, 30 volunteer lawyers and 27 law students worked with 94 clients on 98 different legal matters. George Hofheimer of the Filene Research Institute explains how to shift from a mindset of resistance to a culture of innovation. Read the sidebar at end of this article. In addition to the Michael Best attorneys, another volunteer attorney is on hand during each shift to deal with matters in which the firm has a conflict. Small businesses in Wisconsin need guidance through a maze of complicated legal issues. Law students at the University of Wisconsin need real-world experience to shape them into practice-ready business lawyers. The Law & Entrepreneurship Clinic at U.W. Law School meets both needs. The clinic is the result of a collaboration of the law school with the Wisconsin Institutes for Discovery, Wisconsin Alumni Research Foundation, and several Wisconsin law firms. Since the clinic opened in 2009, more than 100 law students have gained hands-on experience in business legal matters. And nearly 600 start-up entrepreneurs, small business owners, and nonprofit organizations around the state have received free legal guidance. The clinic has helped businesses “ranging from a food cart to a biotech company, and about 15 percent of our clients have been nonprofits,” says Anne Smith, co-founder and co-director of the clinic along with fellow attorney Eric Englund. From 15 to 20 students, either 2Ls or 3Ls, participate each semester and work one-on-one with supervising attorneys from the U.W. Law School faculty. Students are welcome to enroll for more than one semester. Whenever the student and the supervising attorney feel they need outside assistance from an expert who works regularly in a certain area of the law, they can reach out to any of the 16 Wisconsin law firms that serve on the clinic’s advisory committee. Clinic clients also become accustomed to thinking of a lawyer as a key source of support to make their business or organization successful. Parents with substance abuse problems who appear before the Milwaukee County Family Drug Treatment Court face an experience far different from the usual proceedings in CHIPS (children in need of protection and services) cases. Every Friday afternoon, the parent meets with a team of legal professionals, drug treatment counselors, service coordinators, and child welfare professionals who all work with the parent toward a common goal: returning the child to the parent if possible. You might think being outnumbered in these sessions by so many diverse professionals would intimidate a parent. “But you’d be surprised; I was surprised,” says Karen Christenson, the Milwaukee County circuit court judge, now retired, who led the planning and was the first presiding judge in the Family Drug Treatment Court, which began working with parents in April 2011. The result is a dynamic problem-solving session that engages everyone, including the parent, who volunteers to participate in the program. “The philosophy is that it only works if the parent wants to make it work,” Christenson says. The Family Drug Treatment Court aims to help parents not only get clean but also to change long-standing behaviors that led to substance abuse and could lead to a relapse. For consumers, the Wisconsin Judicare online legal clinic provides ready access to legal help, while for volunteer attorneys, it’s a way to “do pro bono in their pajamas,” says Beth Ann Richlen, staff attorney and development director. The online clinic, called the Northern Wisconsin Legal Advice Project, opened in July 2013 with the help of a startup grant from the State Bar’s Pro Bono Initiative. Originally serving 13 counties in the 10th judicial district, the clinic extended its coverage to all 33 counties in the Wisconsin Judicare service area as of Jan. 1, 2014. Richlen and currently six volunteer attorneys answer clients’ questions, which typically require about an hour’s worth of research. Volunteer lawyers can log in from anywhere at any time to view the questions online and pick those they’d like to answer. Enough information is shown to enable the attorney to do a conflict check before proceeding. A new partnership just getting under way will bring in additional volunteers from the Marquette University Law School’s Volunteer Legal Clinic. During slow times at that clinic, “their volunteers will answer our online questions,” Richlen says. Innovation – big or small – means that the profession is proactively adapting to today’s competitive environment. Here are five additional noteworthy stories about Wisconsin lawyers who set about to make change to create value or an advantage in today’s marketplace. Now Peterson and his team have developed a new technology to make it easier for both providers and consumers to find coverage. Called My Coverage Plan, it’s a software tool using decision-support and electronic health record technology. ABC for Health received a patent for it in 2012. Finding the right coverage can mean huge savings to both consumers and health care providers. Peterson notes, for instance, that Wisconsin hospitals face a billion-dollar-plus shortfall for care provided but left unpaid. Atwell struck on the idea of using search warrants for social media evidence, as well as noncriminal court records, to help her distinguish the “deadbeat” from the truly “dead broke” parents. As a result, her office collected $125,000 in owed support in 2013, compared to an average of $5,000 in years past. Now Atwell and her staff are catching more of the con artists. For instance, a parent shows up in court claiming to be disabled, dragging a leg, and then is pictured playing tennis on his or her Facebook page. Rather, Edari uses video and multimedia tools to tell her client’s story. She first did this when she was a federal public defender in Kansas. For instance, one client’s federal sentencing guidelines were “off the charts,” Edari says. The woman seemed sure to go to prison. But while she was out on bail for a few months, the client “made a 180-degree change,” Edari says, by kicking her meth habit, going to college, and counseling other addicts. Thanks to a video showing interviews with several people who could attest to the woman’s transformation, Edari succeeded in convincing the prosecutor and his supervisor to ask for probation, rather than prison. Ultimately, the judge agreed. Corporate clients expect more than legal advice from their outside counsel, especially since the 2008 economic downturn. “They’re looking for professionals who have a keener understanding of the matters that are important to the clients’ businesses, as opposed to what is historically important to lawyers,” says Michael Ostermeyer, an attorney with Quarles & Brady in Milwaukee. That realization deepened when Ostermeyer attended business school at the University of Notre Dame. He began to discuss ideas with faculty there and with others at his firm, and from that arose the Partnership Development Program. The program is unique in that it is an academic, MBA-style curriculum developed specifically for practicing attorneys. As of April 2013, 24 Quarles & Brady partners have completed the 10-month program, with another cohort to begin in August 2015. An attorney who contemplates going on parental leave or a reduced schedule has many questions: How do I ramp down my work before I leave? How do I ramp back up when I return? What are the firm’s expectations while I’m on leave? Where do I get all the various forms to start the process? And so on. The Working Parent Coach Program, the brainchild of the Foley & Lardner diversity committee, aims to ease the process. “We wanted to have one contact who could provide the forms and answer questions, and we wanted that contact to be an attorney,” explains Tanya O’Neill, chair of the program. Attorneys going on leave each get an assigned coach with personal experience with parental leave or a reduced schedule. The coaches share their first-hand experiences, insights, and advice. George Hofheimer of the Filene Research Institute explains how to shift from a mindset of resistance to a culture of innovation. Where do you start with innovative thinking? Hofheimer advises paying attention to the factors that are causing you the most pain now. As someone who holds the job title of “chief knowledge officer” for the Filene Research Institute in Madison, George Hofheimer is well attuned to the quandaries and contradictions surrounding the concept of innovation. Filene was a Boston merchant and philanthropist who was instrumental in bringing financial cooperatives, or credit unions, to the United States in the 1930s. Today Hofheimer’s organization aims to help credit unions succeed and grow into the future. But whatever one’s field of endeavor, successful innovation relies on striking the right balance between the two opposing forces Hofheimer described above. That is, you must avoid chasing after change just for change’s sake, but at the same time be willing to try new ideas in order to thrive. Lawyers encounter evidence of those external factors every day. New technologies change what they do and how they do it. New online legal service providers pose more competition. Consumers have more information at their fingertips and are less reliant on traditional legal services. Clients’ expectations in terms of cost and response time for legal services also keep changing. All this adds up to create an environment in which, more and more, lawyers must view the delivery of legal services through the client’s eyes rather than from the lawyer’s vantage point. It’s incumbent on legal professionals to recognize the challenges such changes generate, Hofheimer points out, and to find ways to alter law firms’ and legal organizations’ operating models to meet those challenges. To build a culture of innovation, the first step is to get clear on what innovation is, Hofheimer says, noting that it has become a pervasive buzzword in recent times. Even so, much confusion lingers about what innovation truly means. Second, gearing up for innovation requires having a champion within the organization. In a legal setting, that might be a business practice leader, a firm’s administrator, a chief financial officer, a managing partner, a legal agency’s executive director … anyone who “gets” innovation and is willing to lead the way to keep it on colleagues’ radar. That person also has to have the stamina and courage to stand up to the internal naysayers and critics who try to derail innovation because they oppose change. Resistance to change is a natural human condition. And lawyers, whose professional training revolves around following past precedent and traditions, may be extra susceptible to that resistance. Lawyers in small offices or solo practices don’t have to try to persuade a large group of people to pursue innovative ideas. They have only themselves to convince, and they can act more quickly. But they have a different challenge: finding the time to research and implement an innovation, while also handling numerous daily tasks required to keep their firms or organizations afloat. These various hurdles to innovation are significant and never easy to overcome, Hofheimer acknowledges. The key, he advises, is to start with small, manageable projects. Explore the possibilities in low-risk, low-impact, and internally focused initiatives. That way you gain proof that this approach works. “Then you can consolidate those successes into bigger projects that may be more focused on the external world and the business side of things,” he says. “Over a multi-year timeframe, innovation becomes part of the value system” of the law firm or organization. In this way, the inclination toward innovative thinking takes root over time. Awareness builds, among everyone involved, that innovation is crucial and deserves commitment. Again, Hofheimer emphasizes that all through this process, the focus must remain on existing goals. People then will see that an innovation makes sense and is leading their organization to where they want it to go. Still, where do you start with innovative thinking? Hofheimer advises paying attention to the factors that are causing you the most pain now.